The quality of our work is proven and rigorously controlled. Every project is translated by a qualified and experienced linguist who is a native speaker of the target language. Then it is reviewed by a professional editor. Each of our translators holds an advanced degree, and has subject-matter expertise in the field corresponding to the document to be translated. We also offer an English editing service, which prepares a document for publication or distribution. If you wish to receive a free estimate and/or assessment of the work that you need done, you can send us a message using the contact form below, where you can also attach and send us your documents. 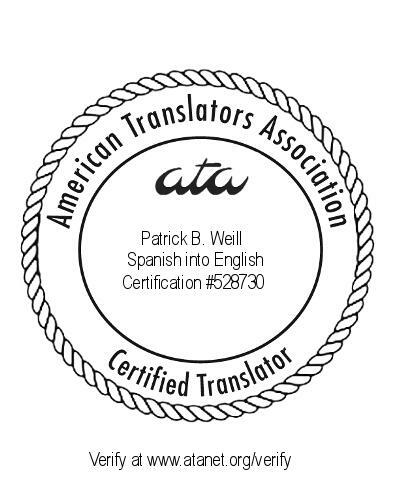 Patrick Weill is an ATA-certified Spanish-English translator and professional editor with thirteen years of experience. He has significant experience in a wide range of fields such as law, medicine, science, technology, and commerce. He is the president of a translators association in Mexico, COTIP Asociación de Traductores e Intérpretes de México, A.C. Companies, institutions, entities, and professionals around the world rely on the top-end services of Weill & Associates. The cost of these services is not fixed; each project is evaluated individually. Our pricing formula depends heavily on the length of the text but also on such factors as its technical level, the urgency of the project, and the format of the file. Our prices are competitive. Remember, however, that if quality is important to your project, you should not select a service based on price alone. You will want to select a quality-controlled service that hires professionals who will research the topic and find the right terms, who are native speakers of the target language, and who are experts in both the source and target languages, so that the meaning of the source language is preserved technically, aesthetically, and unambiguously, without errors. This is what Weill & Associates offers. If you would like to send a payment to Weill & Associates using your credit or debit card, or PayPal account, please click on the 'Pay Now' button below.